Celebrities and civil rights figures declared their support for imprisoned Palestinian teenager Ahed Tamimi, 17, who was detained by Israeli forces on December 15, after a video of her slapping an Israeli soldier who broke into her house in Nabi Saleh village, near Ramallah, went viral. A number of high-profile entertainers, scholars, and civil rights icons signed on Monday a letter in support of Ahed Tamimi and other Palestinian children imprisoned by Israel. American political activist and author Angela Davis said she doesn’t only stand with Tamimi, but with the rest of the Palestinian children held in Israeli prisons. American philosopher, activist, critic and author Cornel West also spoke out in support for Tamimi. American academic and television personality Marc Lamont Hill thinks that Tamimi’s case reflects a crisis in the Israeli legal system. Phillip Agnew, director of Dream Defenders Mission, a member group of the Movement for Black Lives that recently initiated a letter in support of Tamimi signed by a number of high-profile entertainers and activities, said the only way to protect the community is to build a loving world for everyone. Tamimi and her mother, Nariman, also detained on the same day as her daughter, appeared in an Israeli military court near Ramallah on Tuesday, but the hearing for Ahed was postponed until March 11 and Nariman until March 6. 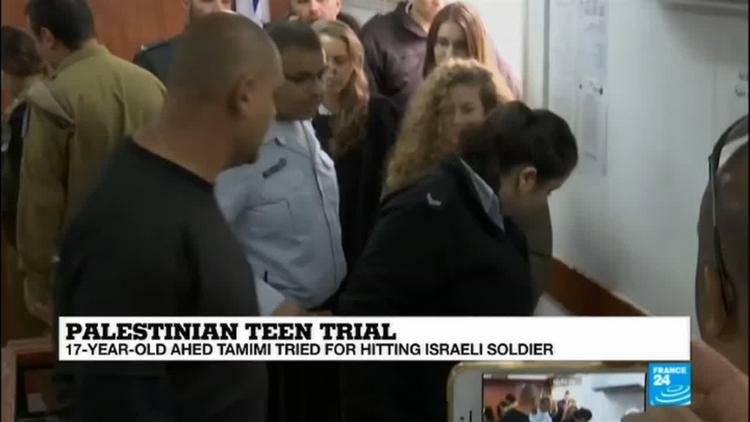 According to WAFA, the Tamimis’ attorney, Gaby Lasky, said Israel fears the attention Tamimi’s case has garnered.